We’d love your help. 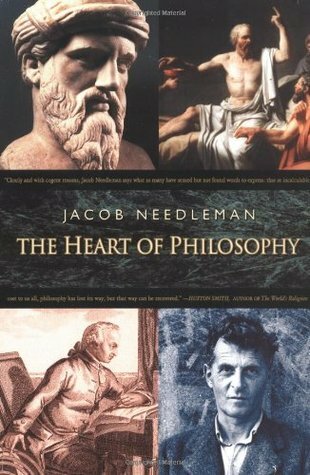 Let us know what’s wrong with this preview of The Heart of Philosophy by Jacob Needleman. To ask other readers questions about The Heart of Philosophy, please sign up. I've been reading and learning from Jacob Needleman for a few years now, and was delighted to accidentally discover this book, in which he addresses all the most important themes of my own work: philosophy, wisdom studies, and education. In some chapters Needleman discusses how certain philosophers (Socrates, Pythagoras, DesCartes, Kant, Wittgenstein) have followed philosophy's impulse toward self-questioning and the transcendence of ego; in others he tells stories from his own childhood in which he became of aware of this impulse within himself; in others he relates how he attempted to make that kind of self-discovery the point of a philosophy program he started in a high school in the 1970s. (Needleman also wrote a nice piece about this for our journal _Thinking_, 1982). I thought this book would be a nice introduction to philosophy. Unfortunately for me, it does assume a familiarity with Plato, Socrates, Pythagoras, Hume, Kant, and Wittgenstein. So there were sections of this book that I did not understand as I have never studied philosophy. My personal experience reading this book was probably at 2 stars. But I gave it 3 stars, because I did like the parts I understood. I found Needleman's description of teaching philosophy to high school students and their par I thought this book would be a nice introduction to philosophy. Unfortunately for me, it does assume a familiarity with Plato, Socrates, Pythagoras, Hume, Kant, and Wittgenstein. So there were sections of this book that I did not understand as I have never studied philosophy. My personal experience reading this book was probably at 2 stars. But I gave it 3 stars, because I did like the parts I understood. I found Needleman's description of teaching philosophy to high school students and their parents to be interesting. I learned a bit about Wittgenstein's philosophy, with which I was completely unfamiliar. I was inspired to learn more. The book delivers on that which the description describes. This book attempts to make philosophy more approachable by recounting significant discourses in the context of the authors life experience. It is actually a fairly effective technique for introducing the subject. As an entry into some of the major ideas and faces of Philosophy, it's not bad. I think if it wasn't trying to broadly tackle philosophy but started smaller, it might be slightly even more effective. I always think of Phaedrus a The book delivers on that which the description describes. This book attempts to make philosophy more approachable by recounting significant discourses in the context of the authors life experience. It is actually a fairly effective technique for introducing the subject. As an entry into some of the major ideas and faces of Philosophy, it's not bad. I think if it wasn't trying to broadly tackle philosophy but started smaller, it might be slightly even more effective. I always think of Phaedrus and how much Socrates tackled in such an adorable little story. some of the book is a little out there and hard to understand but only in a few small parts. definitely more difficult towards the end. however, most of the reading was easy to understand and the material is great for anyone starting out with an interest in philosophy. I read this book for college but that has not stopped me from recommending it to a few friends already! Needleman explores our need for meaning in life. Probing our deep, even subconscious, desires to know our place in existence. Using Plato, Aristotle, and many others he weaves an entrancing theory. This was one of my first introductions to philosophy.